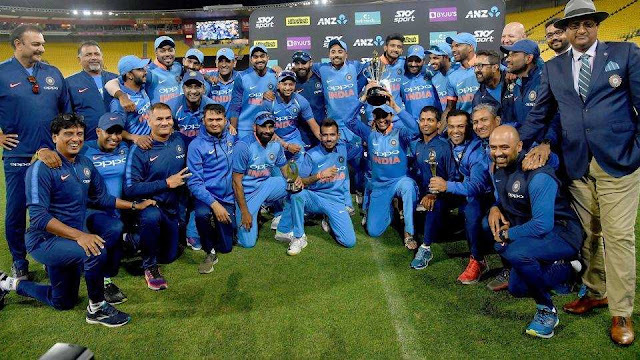 The Indian men's cricket team registered a comprehensive victory over the New Zealand team in the fifth and final one day match and thus won the series 4-1. The first three matches were pretty much one-sided in favour of the Indian team, with the Black Caps babrely been able to put up any fight. But they came back strongly in the fourth match at Seddon Park, Hamilton. Since the series had already been pocketed by the third match, so the Indian thinktank decided to rest their captain Virat Kohli and Dhoni too missed the macth due to his health issue.Unfortunately, in their absence, the Indians were bowled out very cheaply for just 92 runs! Once the two openers got out, the middle-order collapsed like a pack of cards and none could rise up to the occassion. On the other hand, with the victory, the New Zealand side avoided the whitewash. In the fifth and final match, India won the toss and elected to bat and within no time, they found themselves in deep trouble losing their top four batsmen for just 18 runs. Then Ambati Rayudu stiched a much needed partnership of 98 runs with Vijay Shankar, before the latter unfortunately got run out for a well composed innings of 45 runs. But Raydu stayed put and scored an invaluable 90 runs and then Hardik Pandya with his incredible hitting what with a flurry of sixes, provided the much needed kick to India's score. The Indian bowlers got a much respectable score of 252 runs to defend, which they did admirably. Had it not been for Vijay Shankar, Ambati Rayudu and Hardik Pandya, the Indian team wouldn't have scored that many runs. From India's point of view, it was an excellent series, more so in view of its World cup preparations - most of the boxes for the world cup have been ticked, some players delivered under pressure, the fielding has been top notch and the bowling unit has been magnificent. So all in all, it was a wonderful series for the Indian team. As an ardent Indian cricket fan, I just hope that the Indian team continues its winning form well into the forth-coming cricket World cup.